Way back when in 2009 the Falken Tire team also swept the podium in New Jersey. 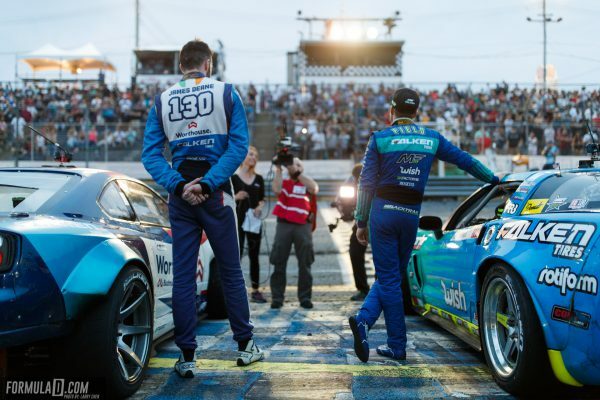 Back then it was Darren McNamara, Tyler McQuarrie, and Vaughn Gittin Jr. on a new Falken tire setting up the new era of dominance in the series. Something about the Falken compound seems to love this track allowing them to secure a second tire sweep of the podium in the tracks long and memorable Formula Drift history. 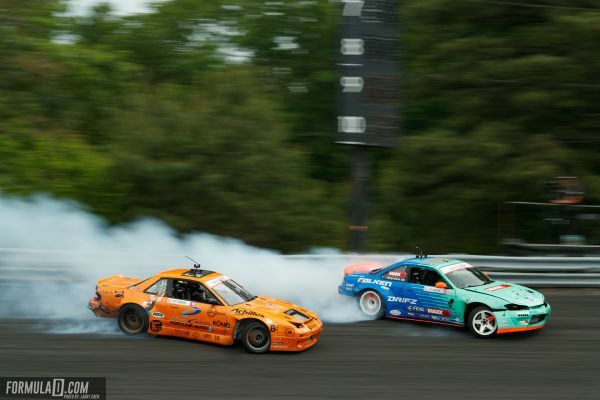 Ken Gushi had some of the most exciting battles of the New Jersey Formula Drift weekend. His Toyota 86 is looked to be the most dialed it has been in some time. Pending some serious mechanical issues I think he can push on to have a successful 2018. The Gushi battles against Kristaps Bluss were perhaps some of the craziest this season. Another Top 16 for the rookie VanKirk who managed to beat Jhonnatan Castro in the Top 32. He advanced to the Top 16 in Orlando after Michael Essa was unable to come to the line making it his second Top 16 of the season. His other two Top 32 loses are both to Fredric Aasbo at this time giving him a respectable loss record among the rookie class. VanKirk now sits 16 points ahead of Dirk Stratton in the Rookie of the Year race for 2018. JTP has been on fire in qualifying the past two rounds and backed it up in tandem by beating Alec Hohnadell and Chris Forsberg before losing to Matt Field in a wild Final Four battle. With this great performance he has jumped to 5th place in the championship and is just 98 points behind the new leader James Deane. 6. Matt Field is Back! I feel like Matt Field has been my punching bag this season in the Top 10 Things. Finally, after a little wall slap/crash in Atlanta I think the Corvette is just his normal drift car. With that, he looked as comfortable as he did back in his S-Chassis days. He was clearly better than everyone on the track this past weekend outside of James Deane. I look forward to his progression this season, with a potential victory for him before the year is done. He is 123 points behind Deane in the Championship so I think it’s a little far back this late in the game for a real chance at his first championship. I do think a top three finish could be in the cards for the teal and blue Chevy. Piotr breaking was the biggest disappointment of weekend. Up until that moment the Piotr vs. James Deane battle was the show stealer than never got finished. According to Deane, Piotr’s car overheated and went into a safe mode shutting him down from having full horsepower. What a bummer his car overheated because that battle was quite insane up until that point. James Deane’s chase entry on the bank was unreal and you should fire up the live stream and go check it out if you missed it. 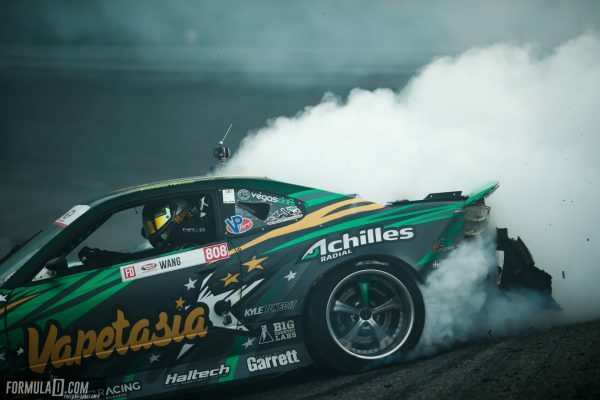 It’s hard to imagine Formula Drift has endured 100 events. 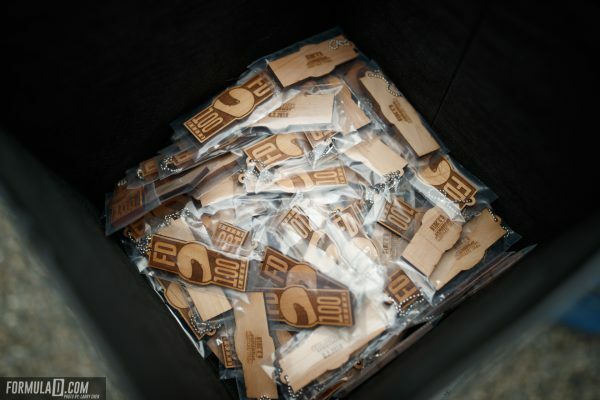 A quick reflection of the series will show you that 27 unique drivers from 11 countries have won a Formula Drift event to date. The progression of the sport can really be highlighted by watching old Formula Drift events videos from Wall Speedway with cars probably a whole foot from the bank railing. Today, that would be grounds for a very poor score, as most drifters can ride the top line of the wall all around the small circuit. The competition has increased massively in tandem with the higher horsepower and strategy that makes up an event weekend. I personally cannot wait to get started with the next 100 rounds. The next event around the corner in another track-favorite, Evergreen Speedway. Poor Forrest Wang had a really rough weekend smashing into Aasbo and then getting smashed into by Matt Field. Both of these events I touched on in #2, but these wrecks caused some serious damage into his S-Chassis. Two years ago at this event, there was a happening that created an Internet frenzy when Forsberg smashed into Wang coming off the bank, resulting in a Forsberg win. Literally the same thing happened at this year’s event with Matt Field. Wang had some interesting things to say with Laurette Nicole in the post-battle interview. It was the first time he really admitted the Forsberg incident was his fault but then said the incident with Field was a, “fine line” call for the judges and could have, “gone either way”. Contact always is tricky in this sport but being given the call against Aasbo due to Aasbo being off throttle I don’t see how the judges could of ruled the Field call any other way. I think one of the best things any driver can ask for when it comes to a judged sport is consistency. The judges made two very tough calls that were very consistent that should leave drivers and fans feeling good about the direction of Formula Drift. The Wang vs. Aasbo battle was a tough call but was a result of contact due to slow speed from the lead driver. This allowed Wang to advance where Matt Field hit him for slowing down in a non-deceleration zone. I think it was tough but consistent which is key. James Deane was off to a really rough start with his championship repeat quest and it seemed he was doing nothing but chasing problems with the S15 round after round. He finally nailed it and took home the victory after some seriously hard fought battles at the Gauntlet over the race weekend. 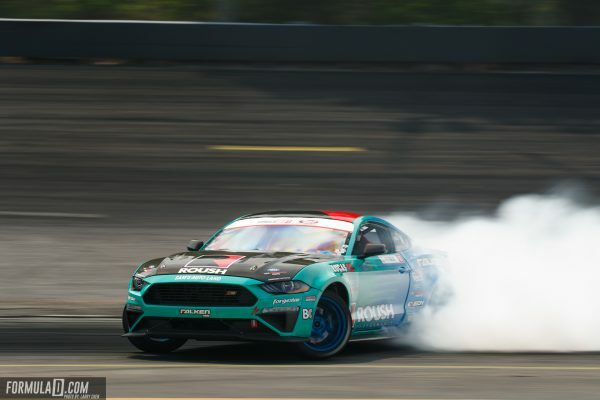 This was his fifth career win and makes him the 10th most winning driver in Formula Drift history after just one and a half seasons in the United States competing.